One of the toughest measures of the stability of an architectural fabric seam is Dead Load Testing, which is found in ASTM D751 Section 80-83. This ASTM Standard applies to Coated Fabrics only, not reinforced laminates, or extruded or blown films. Why? Only a heavily reinforced material will perform in a dead load situation which is the very nature of the performance of an architectural fabric in a fabric structure. Dead Load is a sustained loading rather than instantaneous. The test has long been used and is derived from the architectural fabric industry where strength of a structure is achieved through shear loading. Think, tensile applied polymer coated fabric, loaded between supports, sheds precipitation and holds snow and wind loads. Note in this picture, loading is biaxial. The test itself utilizes a constant load across a seam. An option is to perform the test at an elevated temperature, inside an oven, to simulate an outdoor environment as shown below in the laboratory oven apparatus. Note in the lab, the load is applied via a cantilevered arm delivering the desired load via a moment arm calculation like the following photograph. 1. Generally speaking, all architectural fabrics are sunlight exposed and thus subject to elevated temperatures and thermal swings. 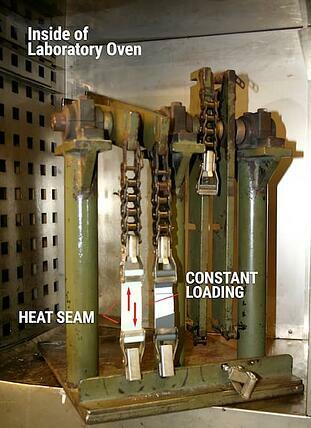 High temperature dead load evaluates the ability of seams to carry loads under those conditions. 2. Seams which are perpendicular to loading are most important to evaluate from a dead load standpoint. Often principal loading is in one direction in a frame structure, but there is usually load of some sort along multiple axes. 3. Because a coated fabric relies on a chemical/mechanical bond between the polymer coating and the reinforcing fabric, dead load is an additional measure of the strength, long term, of that bond. 4. Snow and wind loads are additive to the tension in the fabric and in fact strength is the structure is derived from the tensile loading rather than compressive loading. Dead load evaluates sustained loading on a seam and provides an additional measure of performance. 5. High Temperature Dead Load is the test which most closely evaluates the heat seam relative to the strength of the parent material and eliminates the “weakest link" concern. When evaluating and designing an architectural fabric structure, take note of the Dead Load Seam test and make sure the fabric selected meets all the needed loading strength parameters. Do you have any experience with Dead Load Seam Testing for architectural fabrics? Tell us about them in the comments!